What is Myofascial Pain in Buttock Muscles? One of the most common causes of buttock pain is myofascial pain, which is characterized by pain starting from tight bands of muscle or knots in the gluteal muscles. Gluteus minimus, gluteus medius and gluteus maximus start from the pelvis and insert into the upper side of the thigh bone i.e. femur. 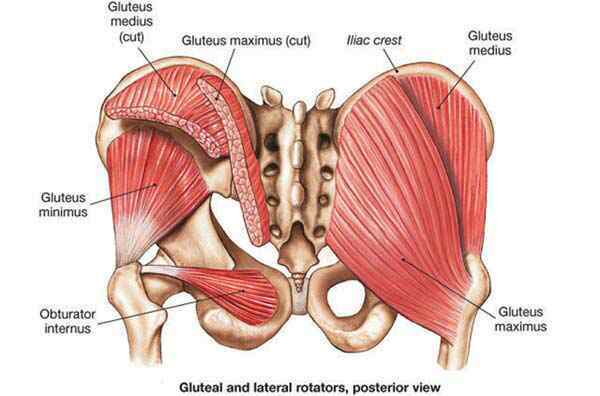 Many smaller muscles are also present in the deeper side of the gluteal muscles such as the piriformis muscle. The gluteal muscles help in straightening the hip while performing activities, stabilizing the pelvis and aiding in other movements of the hip like side elevation and hip rotation. Gluteal muscles are specifically active while squatting, lunging, running and jumping. The piriformis muscles and gluteus medius are the areas that are very much prone to develop the trigger points associated with myofascial pain in buttock muscles. Pelvic instability, lower back injuries and overuse of the gluteal muscles result in the formation of excessive tight bands of muscle called as knots or myofascial trigger points. This may also lead to soft tissue and muscle shortening, increased pressure on nerves and local tissue followed by pain which ultimately results in myofascial pain in buttock muscles. Myofascial pain in the buttock muscles is caused by excessive tightness of the piriformis muscles and gluteals. Myofascial pain in the buttock is caused due to lower back injury, pelvic instability or subsequent overuse of the gluteal muscles. Myofascial pain in the buttock more frequently occurs with activities and sports that involve repeated use of the gluteal muscles such as jumping, running particularly while changing direction, squatting, lunging and sprinting. Muscle weakness, especially in the gluteals and piriformis muscles. Muscle tightness, especially in the gluteal, piriformis and adductor muscles. Ache or pain is often experienced in the buttock. Sometimes pain may also spread into the foot, ankle, calf and at the back side of the thigh. Exacerbation of pain in the buttock while stretching the affected muscles such as while bringing the knee toward the opposite shoulder and during forceful contraction of the gluteal or piriformis muscle such as while running and changing directions. Squatting, lunging, sitting and climbing stairs may aggravate the symptoms. Tightness in the buttock area. Tenderness in the gluteal or piriformis muscles on firm palpation. Applying pressure on the trigger points may sometimes radiate the pain or symptoms down the leg. Starting a comprehensive stretching routine for the muscles of the hip, groin and lower back. Identification of the cause of the myofascial pain and trigger points, which can many a times be secondary to some other problem. Application of deep tissue massage techniques with the combination of proprioceptive neuromuscular facilitation (PNF) stretching. Acupuncture and dry needling may help in releasing tension and lengthening of the muscles. Progressive exercises for improving flexibility, core stability and strength. Monitoring and devising a return to activity and sports plan. Gluteal Stretch Supine: This exercise is performed by lying down on the back. Now with the help of hands bring the knee towards the opposite shoulder until a mild to moderate pain-free stretch is felt in the buttocks or at the front side of the hip. Hold the position for about 15 seconds and release. Repeat four times. Gluteal Stretch Prone: This exercise is performed on the knees and hand. Keep the leg stretched beneath the chest and stomach in such a way so that the knee should come in front of the hips and the foot should come side way. Now by keeping the back leg in a straight position slowly bring the upper body towards the ground until a mild to moderate pain-free stretch is felt in the buttocks. Hold the position for about 15 seconds and release. Repeat four times. Gluteal Self Massage: This exercise is performed by keeping the Spiky massage ball beneath buttock. Now with the help of legs and arms gradually move the body in forward and backward direction and from side to side in order to allow the Spiky ball to rub the buttock region. Make sure to breath normal and keep the leg relaxed. Repeat for about 15 to 90 seconds ensuring there is no exacerbation of symptoms. Applying sustained pressure to a specific tight spot for about 15 to 60 seconds or until the muscle relaxes may also be helpful.